Uses active dissolving cleaning crystals for an active deep clean and fights plaque even in between teeth. 24 hours protection against plaque by brushing twice a day. Contains a unique combination of stannous fluoride and other active ingredients. With an anis mint flavor for a fresh breath. 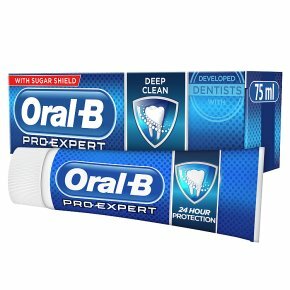 Oral-B Pro-Expert Deep Clean toothpaste has a unique combination of ingredients that provides 24 hours protection by brushing twice a day. It targets and protects against the 8 areas dentists check most: gum problems, sensitivity, cavities, plaque, stains, bad breath, tartar and enamel erosion.